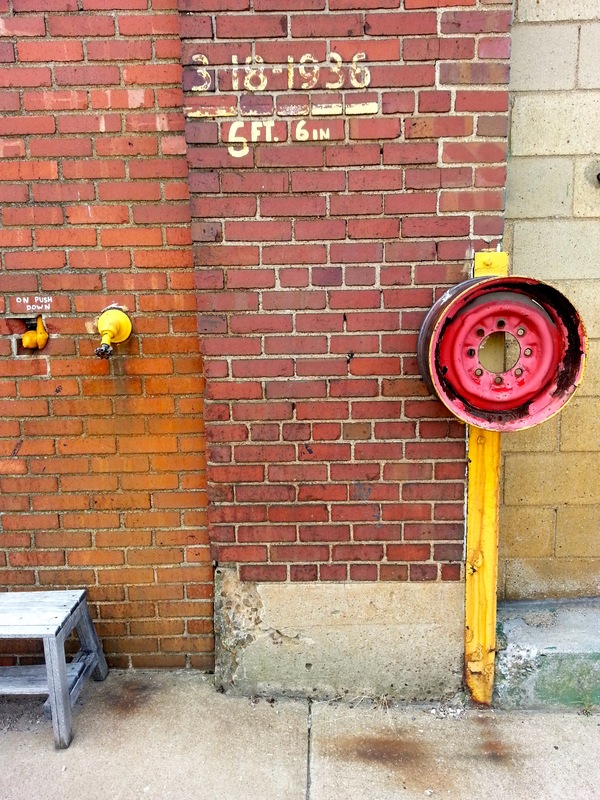 This intriguing painted marker lives on the corner of a big brick warehouse building at Island and Preble Aves. in Manchester. I came across it bicycle-riding through the neighborhood last summer. It read like some weird code: H.W. 46 ft. It wasn’t until thinking about it days later that I put the pieces together: a date (March 18, 1936) and a measurement in feet. This had to be a high water marker for the Great St. Patrick’s Day Flood of 1936. Floods happen in Pittsburgh somewhat regularly–especially right at the end of winter when all the collected ice upriver starts melting en masse–but the flood of 1936 was The Big One, the most devastating in the city’s history and the one that provoked massive flood control efforts in and around the city. I had a heard about the flood a few times, first and most memorably from a much older co-worker at a place I was temping in the late 1990s who had personally experienced it as a child. He had this vivid memory of looking down on the city from Mt. Washington and seeing giant rolls of newsprint from the Pittsburgh Post printing facility downtown inflated by the water and floating down the river like giant marshmallows. I’ve come across very few other physical artifacts of the flood (although one would think there are many others), so this was a really neat discovery. It wasn’t long, though, until I came across this second marker for the flood on a different ride, but also in the same general area of Manchester (exact address unknown). Hi Will. Pauline Tomon here. I am fairly certain that there is a flood marker at the corner of Penn Ave and Stanwix Street. Paulie! Thanks for the tip! The Orbit will check it out and let you know. I did come across one other marker at the old Czech church by the 16th Street Bridge (now it’s the “New Bohemian” art space), but it’s not as interesting as this first one. There’s one across the street from the recently closed 31st ST Pub. Consider it on the list! The Jerome Street Bridge in McKeesport also had one, I think. a: Thanks for the tip! We’ll definitely check that out the next time we’re in McKeesport.